More of my Project 365 images! Day 31 of 365, hanging with Vivi. Vivi is one of my oldest and most trusted friends in SL. One of my favorite things about Vivi is the way she plays at dressing up in SL! Day 32 of 365 (02.01.10), chairs. Carson and I sitting in our matching chairs in our skybox. 🙂 I was in an experimental mood and played around with different filters on this shot. Day 33 of 365 (02.02.10), logout edit. I didn’t take any pics this day, so I cheated and grabbed the screenshot from my logout. Day 34 of 365 (02.03.10), random headshot. Sometime last year, I wrote a blog post on giving your avatar subtle facial expressions. Day 35 of 365 (02.04.10), testing poses. I don’t even really know Lizzie except for what I see on her blog from time to time, as well as from all the hard work she puts into helping run the iheartsl bloggers group. 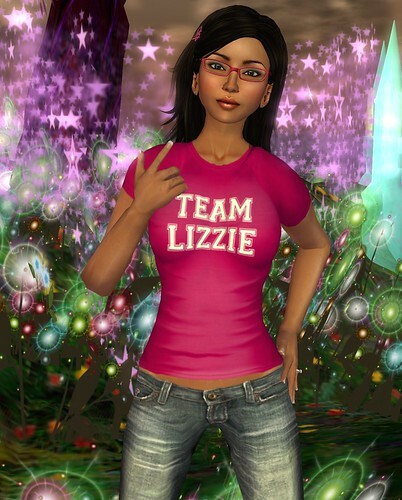 Something about seeing my friends wearing these pink Team Lizzie t-shirts just kind of spoke to me, though; I guess it made me reflect on friendships and relationships. Let’s face it, SL is like any other community and will have moments of toxicity and it can be pretty easy to dwell on that. In the end, however, what’s really worth the expenditure of our energy? Not the negativity and drama fests, that’s for sure. And so, yeah, while my wearing the Team Lizzie t-shirt is an acknowledgement of Lizzie and all her colorful commentary, great blog pics, and her contributions toward making the iheartsl bloggers group work, I’m also wearing the t-shirt in this post because I feel compelled to acknowledge the other message that’s behind it: that there are good people out there who have their friends’ backs and are willing to proclaim it to everyone. Yeah, I realize I might be sounding a wee bit Pollyanna-ish right now, lol. But you know, when someone does something simple like put up a plurk saying “Hey, I really like you a lot :)” (something I’ve learnt from personal experience with Carson 😀 haha) or make a t-shirt letting you know they’re rooting for you… it just feels really, really good. And I like being a part of that, even if it’s just peripherally and with a t-shirt. My skin is from LAQ. I felt like dressing up low-key today because I’m going to be busy in RL this afternoon. When I’ve got a full day ahead of me, I tend to just take it easy in SL and tend to small business issues that won’t consume too much time. T-shirts always go nice with booty shorts, so I busted out one of my favorites from League. I also felt like giving my new Laqroki April skins some face time (ha!) as well as my new Charlotte hair from Truth. The headband that comes with Charlotte is scripted to color change, so I was able to match it to my tees. The freebie Zero Number slippers I got during my recent visit to the head-explodingly adorable Drowsy sim finished up my look. In Hawaii, we don’t call them flip-flops, we call them rubber slippers… or, if you employ local dialect, “rubbah slippahs”. Lol 😀 Over here in the islands, we don’t wear our shoes indoors, so seeing a bunch of slippers and shoes arranged on a shoe shelf out on the porch is not an uncommon sight at all. 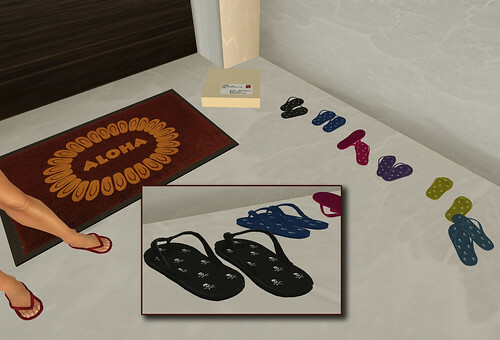 I thought it’d be cute to put the slippers at the doorway of my SL house, and I set them up the way you’d see in RL: some people put their slippers away nicely, others will kick them off hurriedly and haphazardly. Plumeria flowers are super common in Hawaii, so I was really pleased to find these well-made plumeria hair ornaments and this lei. The blossoms for your hair actually come in three colors, and go on either side of your head to indicate whether you’re single or spoken for, cute touch imo! I’m infatuated with this hair, partly because it reminds me so much of the way the dancers from the hula halau will arrange their hair when about to perform in events like the Merrie Monarch Festival. 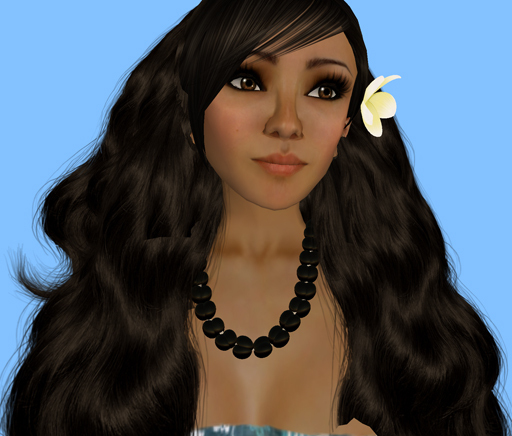 This orchid lei actually comes in two colors; I chose the white one but you can also get a pink version. The kukui nut lei is often used for dressing up for formal events. I was thrilled to find this! The place where I found it also sells an anklet version; because they’re copy/modify, I was able to mod one into a bracelet. ❤ I might try rezzing a copy of one of the anklets later so that I can unlink the prims and mod a couple into a pair of matching earrings. 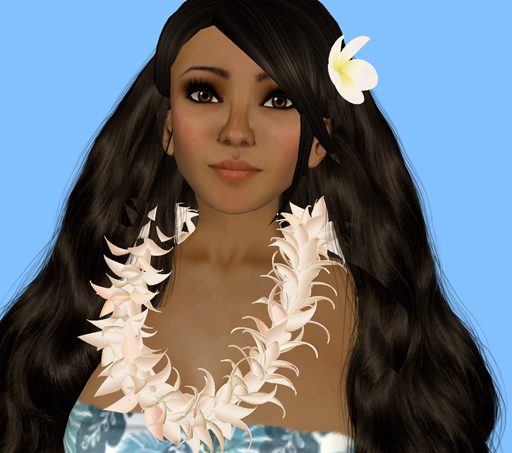 The ubiquitous maile lei, common at weddings and graduation ceremonies and hula festivals all throughout the 808 State, is actually nowhere to be found in SL. 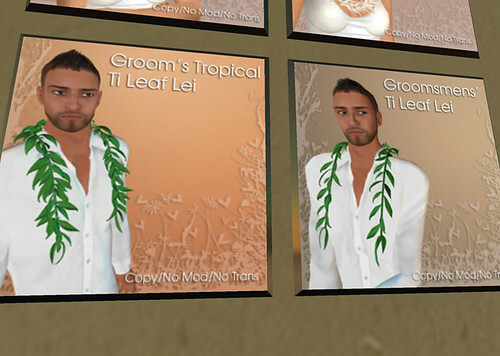 The closest thing to it I’ve found are these ti leaf leis which mimic the look of the maile. These are at the same place where I found the orchid leis.